Creative IT is a Central London based laptop repair centre in the UK specialising in Dell laptop motherboard repair. We have a team of professional hardware engineers and technicians who were trained to the highest standards to offer exceptional Dell laptop motherboard repair and replacement solutions for Dell Inspiron, Dell Latitude, Dell Precision, Dell Studio, Dell Studio XPS, Dell Vostro and Dell XPS notebook models. We can also professionally troubleshoot and repair Dell laptop motherboards with video and display issues such as duplicate images, random characters on the screen, distorted video, no video on the screen, scrambled video, vertical and horizontal lines on the screen, flickering action, intermittent booting and white lines running across screens. We will carry out BGA rework or replacement services for the video chip to fix your Dell laptop motherboard problem. All our Dell laptop motherboard repair engineers are comprehensively trained in laptop motherboard repairs down to the component level. Creative IT, based in London, is the right answer for all your Dell notebook motherboard repair and replacement needs in the UK. 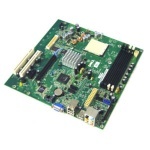 We also offer motherboard replacement services in situations where a repair solution is not a feasible option. With progressive rework systems and technology, we are much more equipped than our competitors to repair Northbridge and GPU issues which are frequent on most laptop and notebook computer models. Please contact us at 020 7237 6805 or email us at info@creativeit.tv or bring in your defective laptop computer to our Central London repair centre for a professional evaluation and accordingly we can carry out expert Dell laptop motherboard repair services for Inspiron, Latitude, Precision, Studio, Studio XPS, Vostro and XPS notebook models.